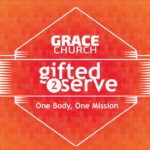 Last week we began a new series called Gifted 2 Serve. And we began to look at Ephesians 4 specifically on how God has empowered us and gifted us 2 serve. God didn’t just rescue you from the prison of Sin in your past, but he rescued you to a future. He calls us to a work that he has rescued us for. A life of purpose and meaning. Then we saw that as we begin to serve one another that God desires a mindset to be adopted. As a prisoner for the Lord, then, I urge you to live a life worthy of the calling you have received. 2 Be completely humble and gentle; be patient, bearing with one another in love. 3 Make every effort to keep the unity of the Spirit through the bond of peace. 4 There is one body and one Spirit, just as you were called to one hope when you were called;5 one Lord, one faith, one baptism; 6 one God and Father of all, who is over all and through all and in all. These are gifts of Christ to the body of Christ. God intends to set the captives free. We are all held in captivity of selfishness and self serving nature. God desires to set us free from that. 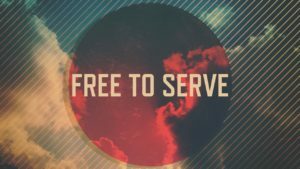 Here is the problem if you have not been set free by Jesus, service will be a duty and a struggle not a gift. He came to us to live the life we could not. But He also now goes before the Father as our advocate and empowers to be the gifts to His church that his plan to fill the universe with His Glory. Invitation: Maybe you don’t feel free today. He came to set you free. He came to this earth to set us free from the prison of death and to give us the power to live a new life, a life of worth and significance. A life of service to the King of Kings and the Lord of Lords. If you don’t feel free let me invite you to ask Him to set you free. Ask Him to set you free from your past mistakes, your rebellion, your selfish desire to do things your own way. Jesus set me free from my sins. I trust what you did on the cross was for me. I don’t want to be a captive anymore. I don’t want to live this life of powerlessness. I don’t want to be a victim anymore, I can be forgiven and set free. I want the power that raised you from the dead to come in and empower me to live a new life. Set me free today Jesus! Maybe that is some of you, I pray that if that is you today that you would take that step in your life today. I pray that you will stop trying to get yourself out of the prison of your own bad decisions and instead turn to Him who holds the keys to life. I promise you will not regret it. For those of you who have experienced that i your life let me remind you… You have been set free to be free! You have been set free to live a life of worth and service in His power. But here is the danger if we do not experience that in our own lives. And then we hear a message like this, That God has given you to the church as a gift, but if you are not living in freedom and power of the Holy Spirit working in you, You will become drained and frustrated and burned out because you are trying to serve in your power not His. You will be sitting there trying harder and harder but ultimately it will not lead to victory but instead it will lead you to death and burnout. So if you walk out of here today and you here the church wants me to serve more, That is not what I am saying. I want you to be set free today to be able to live a life of service to your King. And as you serve Him in that way you will continually be set free more and more in your life. The beauty of service is when you serve Him it leads you to the end of yourself and a greater dependence on Him. So you become more and more desperate for His power and not your own. Jesus set me free from trying to be the savior of everyone else and instead show me how you are my savior. 11 So Christ Himself gave (some to be) the apostles, the prophets, the evangelists, the pastors and teachers, 12 to equip His people for works of service, so that the body of Christ may be built up 13 until we all reach unity in the faith and in the knowledge of the Son of God and become mature, attaining to the whole measure of the fullness of Christ. We are going to be spending a lot of time looking at the scriptures to see how God has Gifted us 2 serve. We are going to take several passage apart and look at them to discover how God does this. We are not going to pick this one apart right now but it important to see this idea. We are God’s priest. You are a priest of God. This is know in theological terms as the priesthood of all believers. That each of us has been gifted by God to the church to act as His priest. This is important for us to think about. Many people think I could never do what you do. I could never get up and preach like you do. I am nothing special! I am just like you. I have a calling on my life to serve Him just like you do. The only difference is I know what my calling is and how HE wants me to use it to further His Kingdom. Look back at Ephesians 4:11. You will not grow up into the fullness of Christ as God wants you to when I am the only gift you listen to. What I do is only one piece. It is an important piece but it is not all the pieces. If this is all you get then you are only getting one small part of what God wants to give to you to grow up into what He desires for you. You need a whole lot of people pouring into your life not just me. I cannot do it all. He has given all of us as gifts to each other so we all can be a part of how He grows us all up in the church. People gifts get to have a tool belt (skill gifts), for the purpose of completing their calling as A-PEST. My calling is to be primarily a shepherd and a teacher. Some of my tools in my belt are mercy, and teaching and discernment. Then I find that there are times when I get a special manifestation of gifting that comes when I need it. This happens most in my counseling when I sit down with someone and God speaks to me and tells me to say something to a persons situation and they look at me and say how did you know that about me or the situation. That is the gift of a word of knowledge. We are all given as a gift to the church, we are then given gifts to use to fulfill our role and then when we are doing those things we sometime receive a special manifestation of the Holy Spirit to bring Glory to God in the moment. We are truly Gifted 2 Serve. Think about it who wouldn’t want to serve if that is how it works. But many Christians don’t experience it that way. Me included at times. Why? Because we are still held captive to the flesh, and trying to serve in our own strength instead of the power and strength of the Holy Spirit. So what is the answer. If the Son set you free you are free indeed. Important note about gifts: All people gifts and skill gifts are also commanded to every believer. I will stress this over and over again. Because this is part of the great misunderstanding of gifts in the church. Many people think that they must be gifted in a special way to be used of God to do a certain thing. But each gift has an underlying command to each and every believer. As we look at each of these gift I will point out to you where they are commanded. Also and we will wrap up this week here with this. There are 3 purposes for each of these gifts given. To do – We are not given gifts and then told to not use them. Instead we are given these gifts to use them for the purpose they are given. To be an example – The truth is as we operate in our gifts we naturally encourage others to use the Gifts God gives them. When we serve by the power of the Holy Spirit it is exciting and people want to join in. This is why I believe Friends Unlimited is blowing up in a good way. Because we see people using their gifts and it becomes infectious. To equip other to do – Finally, as we use our gifts and we see God do it through others they encourage each of us to follow the commands of God and they can help equip us to all do all of the commands by the power of the Holy Spirit. Next week we will dive into what are the people gifts and what do they mean.